"The Gist Hunter & Other Stories" chronicles nine unique stories set in the Dying Earth-esque planet that expands the universe of Matthew Hughes's Archonate novels. This series of stories best introduces and plays companion pieces to "Black Brillion," "Fool Me Twice," and "Fools Errant." The tales of Henghis Hapthorn, Old Earth's "foremost freelance discriminator," combines the best of mystery and science fantasy while recalling the excellence of Gene Wolfe's arch irony and the witty mannerisms of Jack Vance. Though fantastical, something is true-to-life in Hapthorn's amusing and bewildered set of conversations and circumstances. It's a futuristic pull with just the right quirk. The stories of lowly student Guth Bandar and his slightly off-beat and unconventional studies slowly reveal the complexities and wonder of the amazing noosphere. As Banter roams through life and studies, the incredibly vital noosphere acts as the Archonate's collective unconsciousness. Bandar's rise from his student status to veteran noonaut will have him quickly realize that a little learning is dangerous learning when spread too thin. 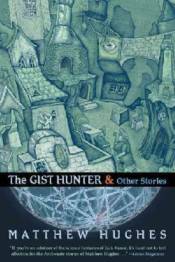 "The Gist Hunter & Other Stories" is a perfect introduction to the great work by Matthew Hughes, and one that admirers of science fiction and fantasy will respect and enjoy.